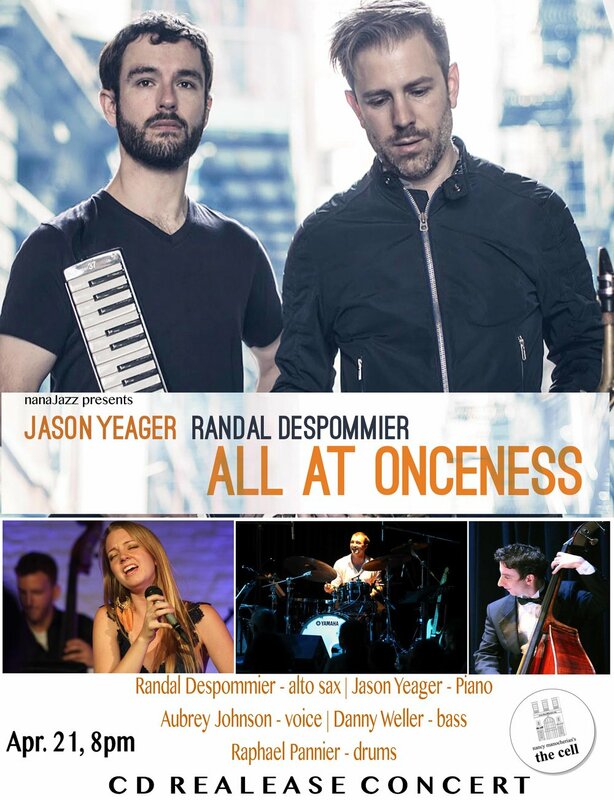 Brooklyn-based Red Piano Records is proud to announce the release of saxophonist Randal Despommier and pianist Jason Yeager's first collaborative album, All At Onceness, a soulful mix of improvisational arrangements of Baroque, Romantic, twentieth-century, and contemporary pieces. With source material ranging from Bach to Stravinsky, Scriabin to Messiaen, these intrepid composer-improvisers stake out their own territory in a diverse program that combines folk-like melodies, evocative harmonies, and infectious rhythms. When New Orleans-born jazz alto saxophonist and classical composer Randal Despommier moved to New York City in the summer of 2013, he teamed up an with award-winning jazz pianist/composer from Boston, Jason Yeager, to explore improvisational arrangements of classical repertoire. "Jason and I were both interested in building off of the jazz tradition by turning to the classical oeuvre and vice versa. During our jam sessions, we'd mess around with jazz standards, preludes by Scriabin, and folk songs; then we'd arrange, rearrange, and sometimes 'de-range' pieces, as Jason puts it; the result was what we felt to be a coming-together of various musical styles from the past and present. We decided to call this approach All At Onceness, a term coined by the Canadian media scholar, Marshall McLuhan." Randal Despommier is a New York-based composer, saxophonist, and educator from New Orleans, LA. His unique and extensive background in jazz, blues, and Western classical music results in a distinct twenty first-century compositional voice. Despommier's original music ranges from contemporary art songs to jazz adaptations of Medieval and Renaissance music. His debut album, an original song cycle entitled Circus of the Soul will be released on Albany Records later this year. He directs the music program at Bard High School Early College in Manhattan and has taught jazz history with the Bard Prison Initiative. Jason Yeager is a New York-based pianist, composer, and educator, whose music is informed by jazz improvisation, contemporary chamber music, and Latin American folk rhythms. His most recent album, United, with violinist Jason Anick, was awarded 4.5 stars and named one of 2017’s top releases in Downbeat Magazine. In addition to his performance and composition work, Yeager teaches piano at Berklee College of Music.